The Power of Faith and Prayer is full of Samuel Rutherford's characteristic style of devotional writing. He expounds one of Christ's miracles (Matthew 9:27-31) and unfolds two great matters which concern the Christian - faith and prayer. The book was originally published in 1713, long after Samuel Rutherford's death. Amazingly this is the first time the book has been republished since then. 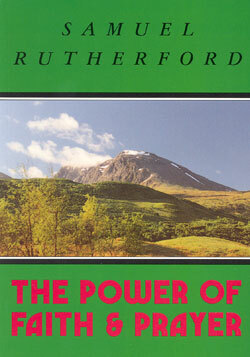 Samuel Rutherford (1660-1661) was one of the greatest preachers and theologians of Scotland. He is renowned as the writer of a most remarkable series of devotional letters - a religious classic full of rich spiritual enjoyment.